Tap A Desired Type and Thickness (Depth1) Number Below for Prices in That Group. 1. "Depth (distance from face to rear edge of piece)" may vary slightly from given values depending on material's type, availability, manufacturer's origin & method of measurement (inches or metric), etc. Brushed & Polished Natural Stainless Steel fabricated metal house numbers & letters provide a very durable, high-end quality number or letter for your business or residential needs. The stainless steel alloys consists of either c304 or c316. Pieces in this category are recommended for retail or architectural letters or numbers. Our uncoated natural fabricated numbers & letters up to 24" in height are produced from flat sheets of 24-gauge (returns) and 18/20 gauge (faces) Alloy c304 or c316 Stainless Steel. These alloys allow our plant to precisely cut the various pieces to be welded together. Alloy c304 provides excellent corrosion resistance, effectively combating tarnishing under most circumstances. We recommend alloy c316 for marine environments, humid conditions, or environments influenced by harsh chemicals. As a rule of thumb, our experts suggest that alloy c316 should be used for environments within 50 miles of a salt-water coast. REMINDER: Occasionally, clear Stainless Steel will develop rust spots from minute iron particles such as polluting iron dust particles from busy thoroughfares. Your stainless numbers or letters must be maintained by both cleaning and occasional polishing with a quality stainless steel cleaning/polishing agent. NEW PRODUCT: Our Fabricated numbers & letters can be used with LEDs to create internally illuminated house numbers and letters. These products are UL Listed and will comply with code requirements. 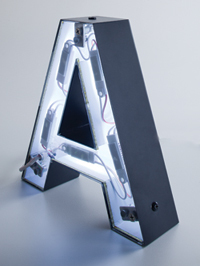 These "halo lit" letters and numbers with LED lighting satisfy the need for an extremely high end look for your application. The halo lit pieces require engineering calculations to determine transformer load and LED placement. Consequently, we cannot make quotes for your project without first knowing all of your unique requirments. To order house numbers or letters with LED illumination, please call us with your requirements. Our warranty for halo-lit pieces requires important contraints relating to both manufacture and installation. The installation must comply with legal requirements (electrical code). To manufacture these numbers and letters with halo lighting elements we require dimensions no less than: 1" stroke, 1.5" depth, 6" height. HERE: for chips of finishes for fabricated stainless numbers and letters. HERE: for list of fabricated styles. HERE: for Fabricated rear-view image and hardware mounting type.